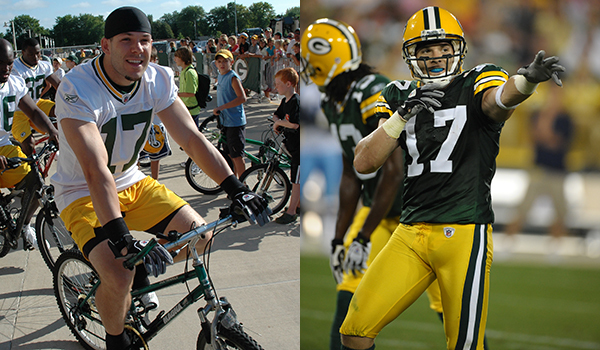 Former Packers WR Johnny Quinn, who played four preseason games for Green Bay back in 2008, is a member of the U.S. Olympic men’s bobsled team competing in Sochi, Russia. Quinn, now 30, first tried to latch on in the NFL with the Buffalo Bills in 2007 as an undrafted rookie out of North Texas. He was released by the Bills prior to training camp and then signed with the Packers following the 2007 season. In the 2008 preseason, Quinn caught four passes for 32 yards and had one special teams tackle for the Packers. He was released in the final roster reduction prior to the regular season and went on to play in the Canadian Football League for Saskatchewan.